2017 pauses with the horror movies for a while and delivers the kind of blockbuster March whose film slate would not look out of place in the summer month of your choice (except for August, of course). March's leading films will be a moody and predictably well-reviewed superhero film, two remakes that could plausibly be titled Beauty and the Beast, and a film I'll guiltily admit is my most anticipated television show adaptation yet. Tim Burton's 2010 live-action remake of Alice in Wonderland came in as one of the heralds of the regrettable 3D movie phase, and left as the founding father of another, perhaps even more profitable sub-genre: the live-action remaking of the entire pantheon of Disney's animated fairytale classics, an idea so obvious that everyone except for Disney had been doing it for years. As rival studios got out of the way (the 2012 Snow White films were among the last to try), Disney has unleashed Oz the Great and Powerful ($234 million), Maleficent ($241 million), Cinderella ($201 million), and in particular The Jungle Book ($364 million, wow!). The Little Mermaid and Dumbo are also on their way. 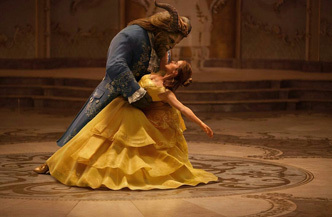 This year's chapter is a live-action filming of the wildly successful 1991 animated film Beauty and the Beast, which grossed $218 million and became the first animation to be nominated for the Academy Award for Best Picture (back under the old, good, system of a maximum five Best Pic nominees per year).